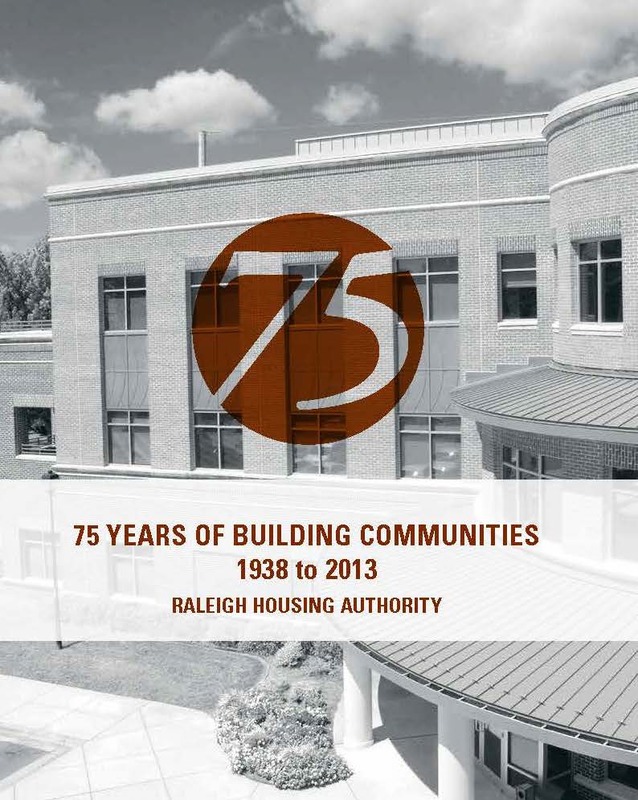 Celebrating 75 Years - Raleigh Housing Authority. 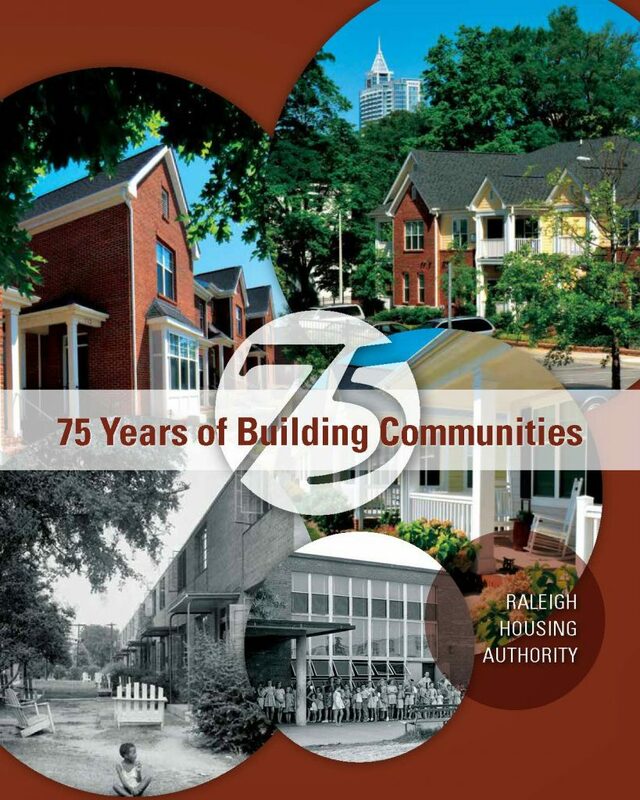 This Anniversary Brochure was published in 2013 for the purpose of acknowledging the first 75 years of Raleigh Housing Authority. In the late 1930s America was still trying to free itself from the Great Depression. Unemployment was over 20% and families were struggling to make ends meet, many of them in unsafe and unsanitary housing. Working people were in low-wage jobs or only able to secure sporadic employment. There was very little vacant housing in the City of Raleigh. The need for housing was great. In Raleigh there were pockets of slum housing that by any standard would be considered unsafe and unsanitary. Houses were located very close together with wood or coal as the primary sources of heat. This raised concerns relating to fire and the probability that it could spread quickly from one home to others. Homes had little insulation and many homes did not have electricity. 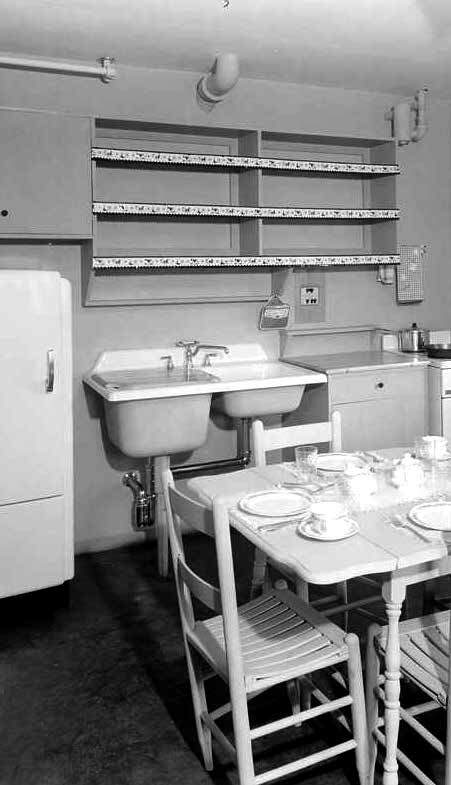 Many of the initiatives that started during the Great Depression focused on homeowners with little attention directed toward families in need of rental housing. Toward the end of the 1930s and early 1940s, the nation’s attention began to move toward housing rental families and addressing the stubbornly high unemployment. 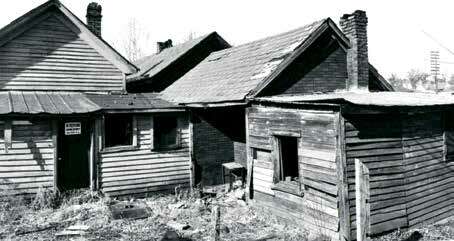 “Slum clearance” was viewed as a way of adding local jobs while also addressing the need for housing. The high level of substandard housing started to receive more attention as citizens began to believe that our nation could not be great with so many of its residents living in squalor. In a News and Observer editorial from 1939 it was stated, “A decently housed citizenship is the first essential to a good citizenship. Better housing means a better town.” This sentiment represented the thoughts of many Raleigh residents. Site of Walnut Terrace prior to its construction. What is a housing authority and how is it funded? 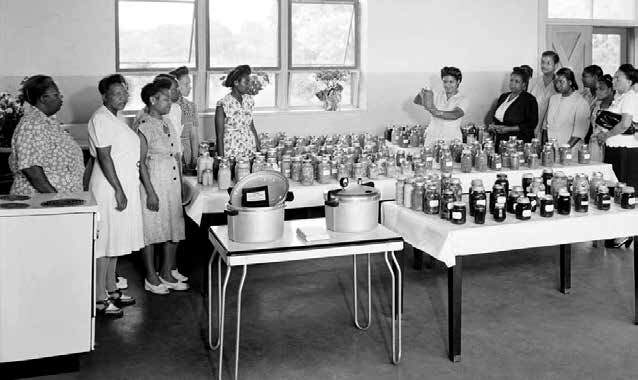 Residents of Chavis Heights learn the art of canning. After much discussion, Congress passed the U. S. Housing Act of 1937 which was the first national housing legislation. This legislation served a dual purpose: providing low-cost housing to replace slum housing and improving the lagging economy by providing jobs in the building industry. This Act established the United States Housing Authority and provided for the establishment, through state law, of local public housing authorities to build, own, and operate housing for low-income families. Housing authorities are chartered by the state and are not part of city government. Any locality that wished to form a public housing authority had to secure approval from the city commissioners and raise a certain amount of local funding (10%) to match with federal funding for the construction of public housing. Raleigh was the second municipality in North Carolina to reach its fundraising goals. With the funding in place, plans began for the purchase of land for construction of two public housing sites – Halifax Court for white families and Chavis Heights for black families. Each locality established its rents taking into consideration the incomes and sizes of the families to be served. In the segregated society, the rental rates for minorities were lower than for white families because their incomes were less. The authority funded its operations from the rents it collected. By the start of 1942, RHA had constructed and occupied 464 units on the two properties. The authority added 150 more units to these sites in 1952 to address the needs for veterans’ housing. 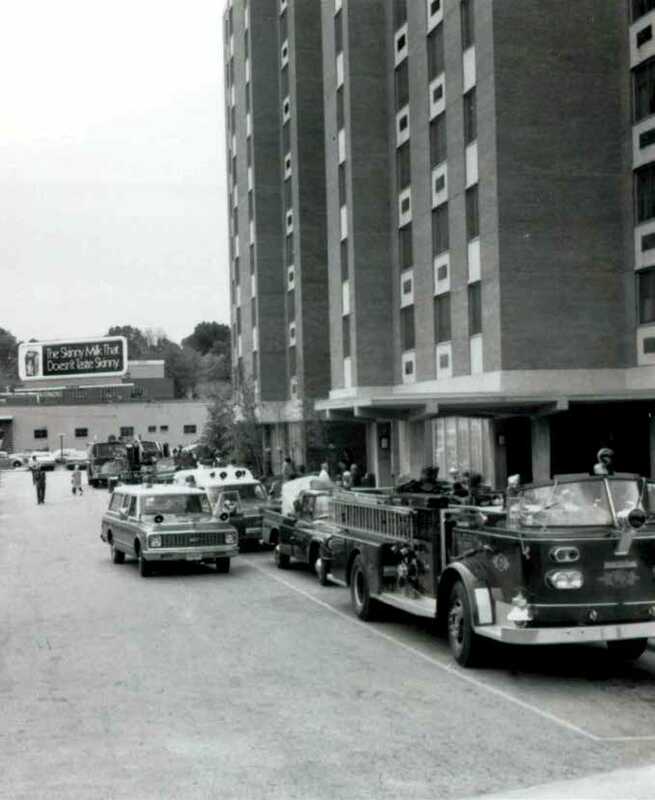 RHA completed a third large site in 1959 called Walnut Terrace. In the early years of public housing very strict tenant selection policies were in place. Unwed pregnant women could be evicted and large fines were levied for property damages. A staff member would visit the home of each applicant before they were considered for public housing occupancy. Families were required to have two parents in the household, employment, good personal references, and live in substandard housing. During these years, RHA functioned as a business with minimal regulations and funding from the federal level. Public housing was functioning as intended – families moved in, stabilized themselves, and moved out for other housing opportunities. However, this changed drastically in 1969. In 1969 the Brooke Amendment was added to the Housing Act of 1937 which would forever change the way public housing was funded and operated. This amendment set the maximum rent an assisted family would pay at 25% (and later 30%) of family income. Prior to this time, housing authorities had been increasing rental rates to cover increasing costs. In order to limit the rent that could be collected, the federal government added operating subsidies to cover the expenses that the limited rents did not. Along with this federal funding came increased regulation which continues today. But it’s been a home for a lot of people, a safe and healthy place to live for a lot of people who would not have had anywhere, had not they built these buildings. RHA experienced considerable growth in these years. This was due in large part to the competitive grants that were made available for unit construction by the federal government. 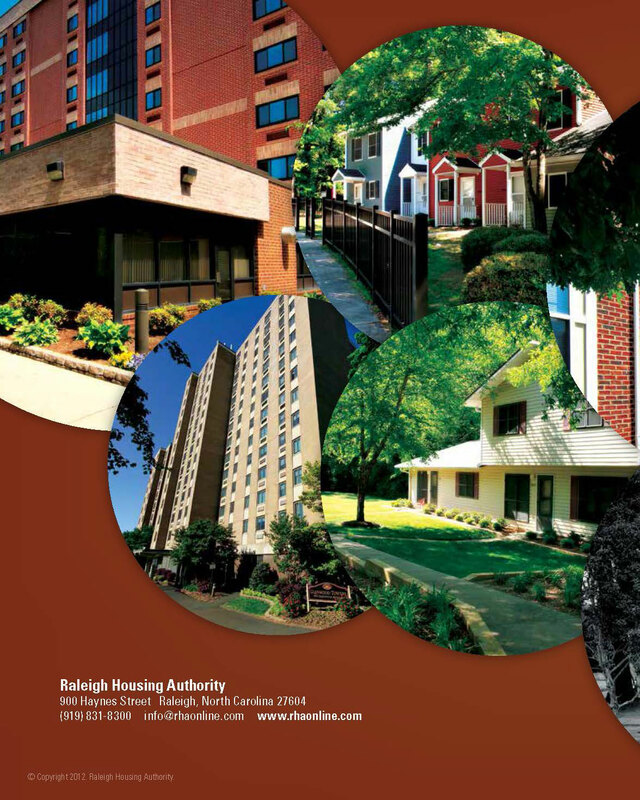 The City of Raleigh adopted a Scattered Site policy in 1978 which limited the number of public housing units that could be built in any one location to 50 units. However, HUD’s design standards were still for basic housing and could not include air conditioning in units unless it was housing designated for the elderly or disabled. Favorite memory – It might seem simple – but the sidewalks and the paved road. That amazed me. And a playground, somewhere decent to go play. We had lived in the country and we played in the field. In Walnut we could roller skate on sidewalks. Mr. Craven Avery – Family moved into Walnut Terrace in 1969 when he was 13. He is also chairperson of the Walnut Terrace Reunion Committee. 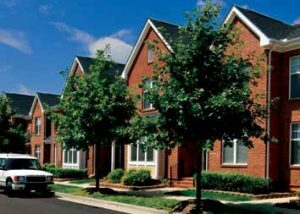 Another significant development in 1974 was the implementation of the “Section 8” tenant-based rental assistance program, currently known as the Housing Choice Voucher Program and RHA’s largest housing program. Unlike the public housing program, the voucher program matches participants with landlords in the private sector. Participants pay 30% of their income for rent and the housing authority pays the balance to the private landlord. Another legislative action that greatly impacted operations was the passage of federal selection preferences. Agencies were required to give a preference to homeless applicants, persons living in substandard housing, and persons paying more than 50% of their income for rent. By this time, the unintended consequences of the Brooke Amendment and the required preferences were taking effect. Public housing had become concentrated with extremely low income families who had a pressing need for supportive services such as child care, job training, and education to break the cycle of poverty. Sadly, providing these services siphoned resources away from the core mission of providing quality housing. This became tragically apparent in 1992 when two residents died in their Walnut Terrace apartment from carbon monoxide poisoning. As a result of this tragedy, RHA would undergo a complete reorganization and transformation. The Agency would begin to seek partnerships with local service providers to secure services so staff could focus on RHA’s primary mission of providing safe, affordable housing. RHA began to explore options for upgrading units, and in some cases, the demolition and replacement of obsolete public housing units. 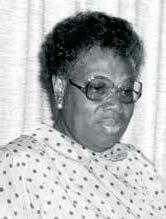 In 1971, a Chavis Heights resident named Mrs. Jessie H. Copeland had a vision of improving the interaction between residents and the Housing Authority. Her idea was to form an organization that would advocate for residents and improve communication between RHA and the residents. One of the first steps was to recruit and train resident leaders from each public housing complex to articulate the needs of the low-income families. Once this core group of leaders was in place, Mrs. Copeland’s vision expanded to a tax exempt organization that could speak for all public housing residents in the city. The group was incorporated by the state as a 501(c)3 non-profit. The organization was originally known as the Inter-Project Council, Inc. However, the term “project” conjured up negative images and Mrs. Copeland came to detest the use of the term “project” to describe public housing communities. She insisted that the name be changed. In early 1990 the organization changed its name to the Inter-Community Council, Inc. (“ICC”) which it retains today. If you are interested in where you live, you will participate and take part to make it better. There have been numerous leaders of the ICC. Two of the longest serving leaders are Mrs. Jessie Copeland and Ms. Lottie Moore. Mrs. Copeland brought the organization from infancy to maturity in her 30 years of involvement. She was known as the Mayor of Chavis Heights due to her unending efforts to improve public housing with a focus on Chavis Heights. She focused on education and The Inter-Community Council (“ICC”) believed it to be the one thing that could move a child or family out of poverty. In that regard she was instrumental in getting the City of Raleigh and RHA to work together to address crime and poor academic performance of public housing students. She was able to get Shaw University and St. Augustine’s College to provide scholarships to public housing children who graduated high school. Once she realized that few public housing children were graduating, her focus shifted to after-school and stay in school programs and later to providing scholarships. Over the years, these programs have evolved and have been absorbed into another non-profit, Communities in Schools of Wake County, which continues to provide after-school programs, free of charge, in five public housing communities. Mrs. Copeland groomed a young working mother from Chavis Heights to become a resident leader. Ms. Lottie Moore relocated from Chavis Heights to the Oaks where she became the Resident President. Eventually Ms. Moore became the Chairperson of the ICC. She continues to serve in that capacity today. The ICC continues to seek community partnerships that enhance the quality of life for residents. This includes programs related to job training, improving curb appeal, promoting healthy lifestyles, and spiritual programs. Although independent organizations, housing authorities are heavily regulated by the U.S. Department of Housing and Urban Development (“HUD”). The best way to understand the regulated environment is to compare the leasing process in the private sector to what housing authorities are required to follow by the federal government. 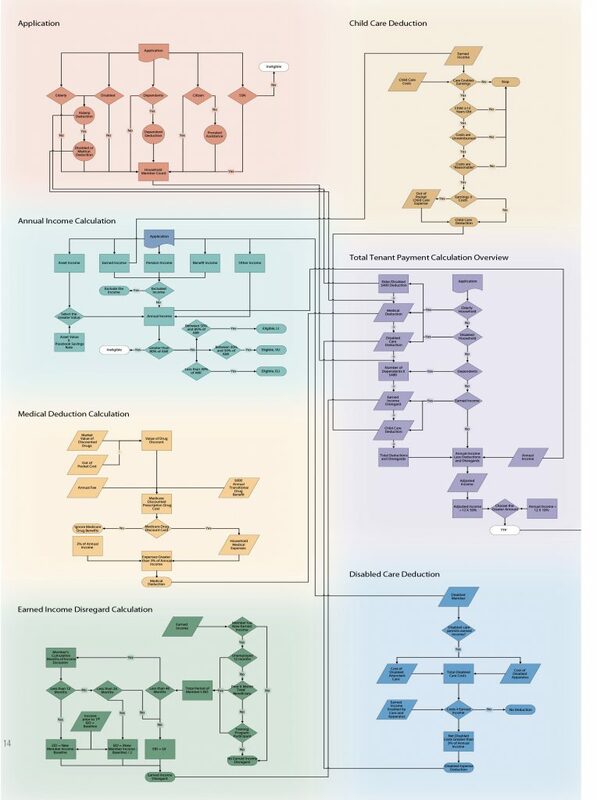 This is illustrated by contrasting the flowchart to the left (private sector) with the flowchart just below. In the mid-nineties, RHA had more than 40 programs under its umbrella. 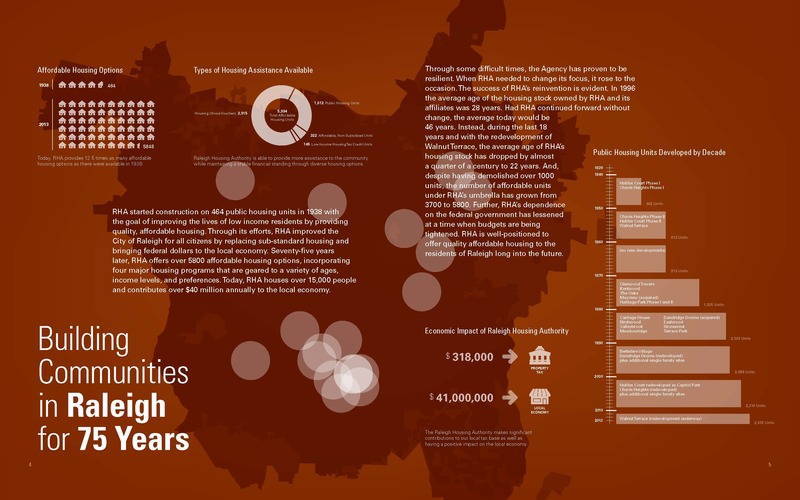 These were city, county, state, and federal programs administered by RHA. 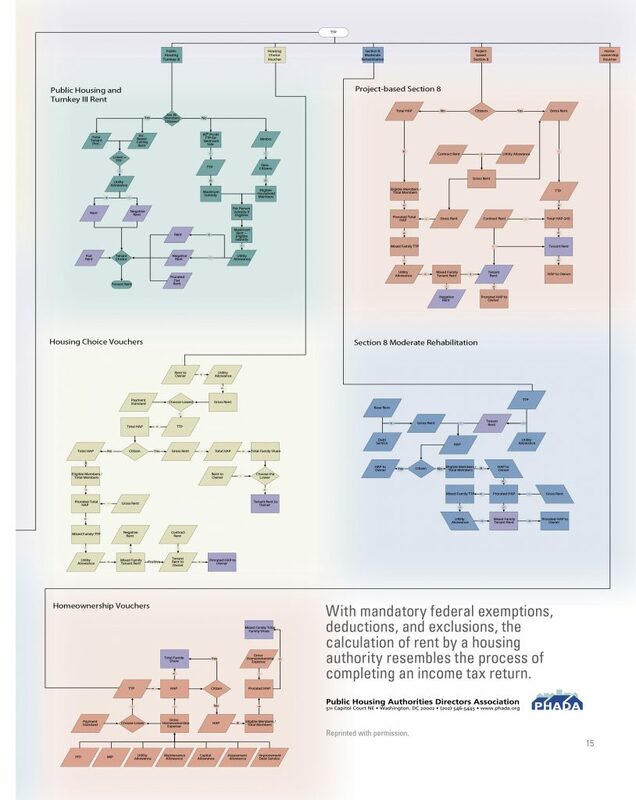 One program had only 7 units and several had less than 20 units, but each had its own unique set of regulations, obligations, and reporting requirements. The number and complexity of programs were drawing resources away from core programs. RHA’s credibility was at an all-time low. With housing stock dating from the 1930s and federal funding not keeping up with federal requirements or increased maintenance costs, RHA developed a plan to reinvent itself. The Agency decided to divest itself of programs that were not cost effective to operate so it could focus on its core mission and core programs. This freed up resources for RHA to improve its housing, get on solid financial footing, and to diversify its portfolio and income streams. Programs from 7 to 400 units were shifted to other agencies or phased out, and from that point forward, RHA applied only for grants that were consistent with its core mission and would be cost effective to run. Quality became more important than quantity. Before seeking to replace the units lost by these changes, RHA’s internal motto became “fix ourselves first.” The Section 8 program, which historically had lease-up rates between 84 and 88 percent, achieved 100 percent occupancy where it has remained since. RHA improved its inspection process to hold private landlords accountable and increased its fraud detection efforts to ensure accountability by program participants. The public housing program, which had over 200 vacancies at the beginning of this period, went from less than 90% occupancy to 99% where it has remained during the ensuing years. 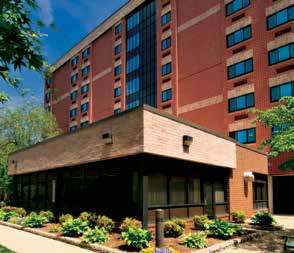 In addition to improving occupancy, RHA improved the quality of its housing with a management by objectives approach. 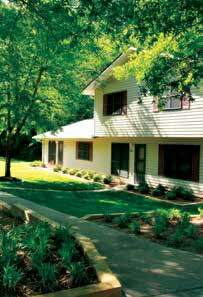 Solid maintenance and property management became the primary focus. Improvements in lease-up, rent collection, fraud detection, and inventory management generated funds which could be directed back into the properties. 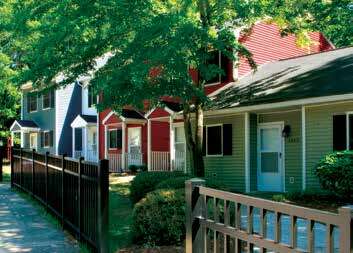 As sufficient funds became available, RHA became the first large housing authority in NC to add air conditioning to all of its public housing stock. As additional resources were developed, RHA started to look toward improving its portfolio through replacement. A highly competitive new federal program titled HOPE VI permitted the previously unthinkable — demolition of outdated and dilapidated public housing and the ability for housing authorities to incentivize working residents. RHA had an excellent candidate for this program in Dandridge Downs. Shaw University constructed the complex as married student apartments in 1972. RHA bowed to pressure from HUD and took over the complex in 1977 using a process known as a deed in lieu of foreclosure, with only $2000 per unit to fix and modernize them. By 1994, RHA had vacated and boarded the property and sought redevelopment alternatives. RHA pursued numerous alternatives and ultimately achieved success when it received its first HOPE VI demolition-only grant in 1998, $500,000 to demolish Dandridge Downs. This was the first major step in dealing with its older properties. There was no federal funding to rebuild the complex so RHA completed the demolition, reactivated its dormant non-profit, and used it to construct 33 single-family homes on the site which it sold on the private market. In 1999, RHA leveraged this success to secure a HOPE VI redevelopment grant of $29 million to demolish RHA’s oldest property, Halifax Court. 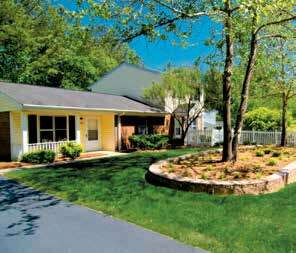 The redeveloped site featured town homes, villas, and single-family homes. In addition to the public housing, the new site was also RHA’s first foray into developing affordable market-rate housing constructed by RHA’s subsidiary non-profit, Capitol Area Developments, Inc. (“CAD”). 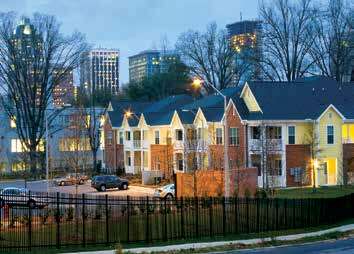 To complete the residential component of the new community, CAD competed for and received $10 million in tax credits awarded by the NC Housing Finance Agency which were combined with mortgages and used to construct Parkview Manor – a 90-unit senior building. Finally, after three decades of being headquartered on the ground floor of a senior building with administrative offices spread across Raleigh, in 2003 RHA cut the ribbon on its current central office located at the new Capitol Park. This new 39,000 square foot facility consolidated all administrative functions under one roof except the property management offices which are located on site at RHA’s public housing communities. This multiple award-winning new community served as a catalyst in the surrounding community by igniting construction of market-rate homes, restaurants, retail, and a new dormitory for Peace College on land purchased from RHA. 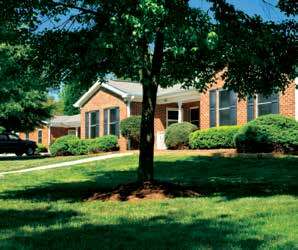 In 2003, RHA leveraged this successful new community completed on budget and in national-record time to secure a second HOPE VI grant – this time for the aging Chavis Heights. The new community went from full occupancy to full reoccupancy in three years and three months, a new national record. With two of RHA’s three large, barracks-style developments now replaced by thriving new communities, the Agency set its sights on the last of the “big 3” properties – Walnut Terrace. By 2009, funding for the HOPE VI program had been cut to the point where only a few grants were awarded nationally each year and the end of the program was in sight. 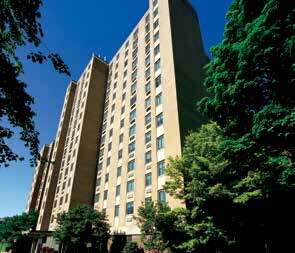 In December of 2009, the RHA Board voted to redevelop Walnut Terrace with or without a HOPE VI grant. This would be the largest development project ever undertaken by RHA and it would be accomplished without additional HUD grants or tax credits. The residents were relocated during 2010 and demolition was completed in 2011. Construction is underway and on schedule to be completed in 2014. Like both Halifax Court and Chavis Heights before it, the new Walnut Terrace will incorporate a mix of public housing owned by RHA and affordable market-rate housing owned by CAD, Inc. In addition, the new development will feature a park, community center, and a maintenance facility. Throughout the nation, more than 3000 local housing authorities strive to improve the living conditions in their communities. Today, RHA is among the leaders setting the standard for quality affordable housing. It is a standard of which North Carolina’s Capital City can be proud. The board, staff, and residents of the Raleigh Housing Authority would like to extend a special thank you to the individuals, corporations, and public officials who have made a significant contribution to our continued success.